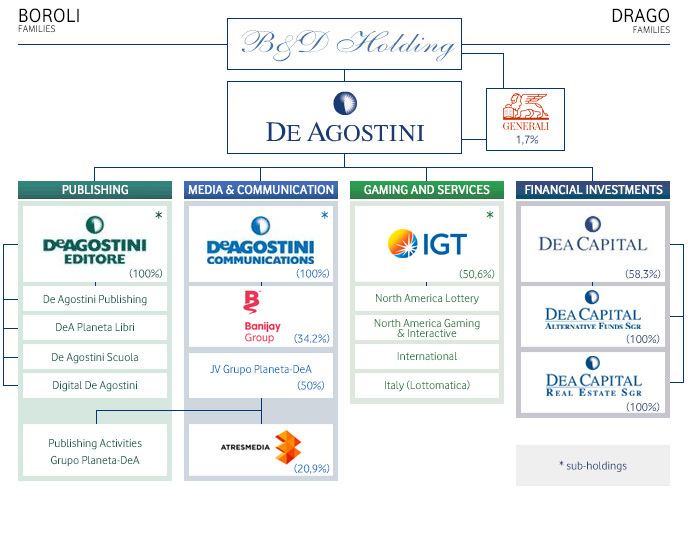 De Agostini Editore: is the sub-holding company active in the publishing sector in 30 countries with publications in 13 languages and organised into areas by product: De Agostini Publishing (partworks), DeA Planeta Libri, in joint venture with Grupo Planeta, De Agostini Scuola and Digital De Agostini. DeA Communications: is the media and communication sector sub-holding comprising the Group's interests in broadcasting, content production and distribution for television, new media and cinema. Banijay Group is among the most innovative and creative companies in the world in the production and distribution of high-quality content for television and new media. De Agostini Group indirectly holds a 30.9% of Banijay Group and partners with Stéphane Courbit and Vivendi. ATRESMEDIA, the Spanish radio and television group, held in partnership with Spanish Planeta Corporation and listed on the Madrid Stock Exchange, is a co-leader in the Spanish television market. IGT: is a world leader in the lotteries, gaming and services market, listed on the New York Stock Exchange. De Agostini S.p.A. controls IGT with an absolute majority share. IGT has extensive know-how for the development of gaming systems and products and sports betting systems through the provision of terminals, hardware and software. IGT is the largest global player in the lotteries, gaming and services sector. Lottomatica, IGT's company, is the sole concessionaire for Italian Lotto and other public games. DeA Capital: DeA Capital operates in alternative investments, with private equity investments and the largest alternative asset management (private equity, real estate and NPL) platform in Italy, via DeA Capital Alternative Funds SGR S.p.A. and DeA Capital Real Estate SGR S.p.A.
De Agostini S.p.A.: also holds other financial investments, including a minority stake in Assicurazioni Generali S.p.A.